Article and Recipe Contributed by Field Staff Writer B. King. Fish are generally good for you, and a phenomenal source of protein. A good portion of the fish you will find available for purchase at the local super market come from a farm of some kind. As with any form of confined animal housing, aquafarms come with their inherent risks and issues. Among these are the prevalent transfer of disease and infection, and the need for antibiotics and pesticides to combat this. Wild-caught fish have a higher level of healthy nutrients, as well as a markedly higher protein content. Furthermore, trout, by their nature, are a supremely particular fish, and require extremely clean and healthy water in order to thrive. If you pull a native rainbow out of a mountain stream, chances are you are engaging your potential food source in a fairly uncontaminated environment. Beyond the practicality of knowing exactly where your food comes from, there is of course great satisfaction in consuming a meal that was obtained by diligence and some principle of skill. Since my early years I have found a gratification in bringing home the day’s catch in order to enjoy and share with others. Whether it be fish, shrimp, or some manner of shellfish, frying and sharing pair well together. That leads in to the method of fresh trout preparation that I would like to discuss. It was developed in large part by a friend of mine who shares many of the same afflictions, not least of which is fly fishing. The main benefits of this technique is that it can be performed on any river bank, and sports a total pack weight of under 5 pounds (burden of the catch itself excluded). Furthermore, it is handy for anyone on a backcountry fly trip, and extremely practical for the broke college student who happens to live near a clear mountain stream. In addition, you will need a small portable burner or cooktop. I traditionally use an unsophisticated burner made out of old cat food cans, but for the sake of accessibility will recommend a Coleman single-eye propane stove. Once you have caught your legal limit for the day, head to the bank and begin preparing the catch by gutting and cleaning the fish. From here, you can fillet the trout or keep them whole depending upon your personal preference. Drop the prepared fish meat into the bag containing your breading mix and shake. Trout are a notoriously slimy fish, so a few moments in the tumble should render them sufficiently coated. Meanwhile, ignite the burner and pour enough oil in the pan to cover the bottom with a thin layer. Place the pan over the burner, and drop the fish in to the pan once the oil is hot enough to fry. 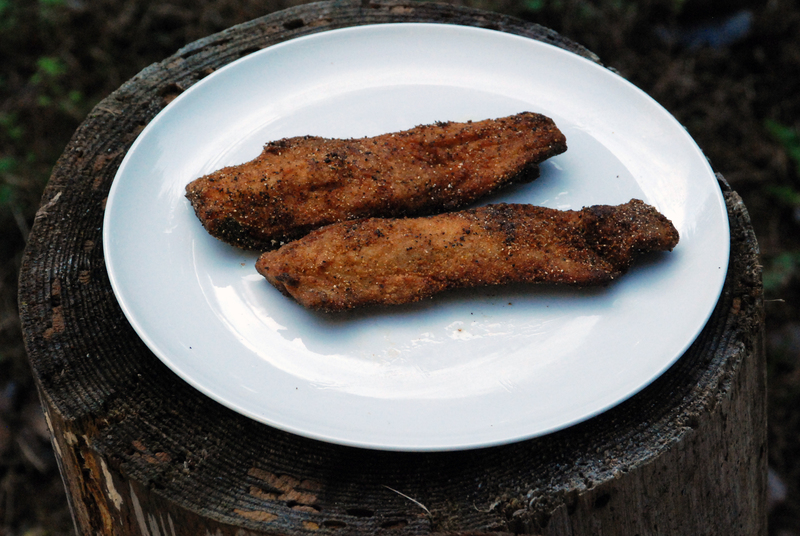 The trick to properly frying trout is to only cook each side once, flipping the fish a single time. The potential here lasts as long as your fuel supply and stock of uncooked trout.